PC/Notebook usability rating: 4/5. About 10 minutes to finish, 2 open questions, need a receipt. Highly recommended for customers, especially senior Kroger customers. Tablet usability rating: 3/5. No mobile page for Tablet. 2 open questions, need to enter personal information. It is a OK choice for Kroger customers if there is no PC. Smartphone usability rating: 2/5. No mobile page for smartphones. You can still finish Kroger Customer Satisfaction Survey via smartphone, and it may take you more than 10 minutes to finish. Web entry. For customers who have the receipt, visit Kroger customer satisfaction survey official website and complete the survey. Mail-in entry. Hand print your name, complete address and telephone number on a postcard and mail to: Customer Satisfaction Survey Monthly Sweepstakes, PMI Station, PO Box 3547, Southbury, CT 06488-3547. Select your response to the question "What method did you use to check out?" Rate your satisfaction with this Kroger in areas such as "The cleanliness of the store" etc. 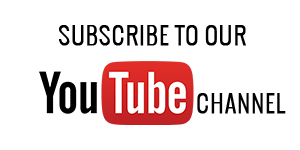 If you have problems in the process of taking Kroger survey online, the video below made can always help you. Kroger is one of the world's largest grocery retailers. Kroger's Family of Stores spans many states with store formats that include grocery and multi-department stores, discount, convenience stores and jewelry stores. 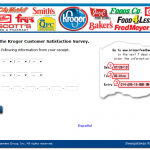 Some customers are looking for www.kroger-feedback.com, which is not the right address for Kroger customer feedback survey. Do not search it in any search engine or out it into your browser address bar. My husband and I shop at Ralph's all the time. We especially like the bakery - and your croissants were our favorites! Last week we were terribly disappointed with the croissants we bought - no butter flavor, not as flakey. Apparently you have changed the bakery you use in LA. Your cashier Joyce at Amelia Station is an excellent employee. She is cheerful, on task, great at checking out in a timely maner. She makes my visit a pleasant one! I enjoy seeing her when it is time to check out! I shop at the Winchester and Houston Levee store in Collierville, Tn. I was very sad to hear that a gift I took to two ladies that work at the store was stolen from behind the courtesy desk. One was told that the camera would be looked at to see who took them but, this had not been done as of yesterday. They were wrapped in white tissue and tied with a green ribbon so no mistake that they were trash. I feel bad that a employee would do this to another one. It had to be someone allowed behind the counter. First I want you to know I have shopped at Kroger since 1971 when I married. I have never made a complaint, but have done surveys. My problem Monday was at the store in Decatur, AL. I do not have my receipt, but the ad in the paper the week before had Pillsbury Cake Mixes for 49 cents and also the Muffin Mixes for 49 cents. There were plenty of muffin mixes but not hardly any cake mixes, so I got a raincheck. When I went Monday to get the cake mixes and a couple of more things, the clerk when I was checking out, was very rude and said the rain check for the cake mixes were wrong and should have been 69 cents and that it was the muffin mixes were 49 cents. I told her no, that it was both of them for that price. I had my 10 cake mixes, but she turned to the bagger and asked him if the cake mixes were not 69 cents last week. He said he didn't know. I told her no, they were 49 cents and it was on the raincheck for 49 cents. She did ring them up for 49 cents, but was not pleasant about it. I don't know her name but it was at the Decatur, AL store where I do almost all my Kroger shopping. Sometimes I go to the Hartselle store, but not this time. Also there is another complaint from me about the Pillsbury selections. There were not hardly any except yellow, white, strawberry, and maybe a butter yellow. No chocolate except higher priced ones, no spice, hardly any except more expensive ones. There were plenty of Duncan Hines selections that were there, but not Pillsbury. I did look on the code to see if there were some missing and no, they were just not listed. Not real happy with the clerk nor the selection of Pillsbury cake mixes that are affordable and on a good sale. My husband has not worked since March and I am disabled. We have to be wise shoppers. Love the pharmacy and the ones that work in there: Carolyn, Gail, Susan, Joseph and another guy. I do use 2 different email accounts so I may have it in clighthouses@aol.com or sgerstr52@aol.com. Thank you for listening to my complaints. 11/8/2016 Fred Meyer stores are great! I'm writing to express my dissatisfaction in your store located in Granby Colorado,I've been shopping there since it's opening, lately for at lease the last year when I go Shopping the shelves are empty... if it's on sale it's not on the shelf, the produce is low grade at best if it's actually stocked, just terrible produce (your buyer should be fired) and the meat isle is a joke, nasty looking beef, the chicken is gross needless to say I haven't bought any meat at your store in the last year. If I was to grade your store I would give it an D- and thats being generous. It seems you are more concerned about the tourist business rather then the local that supports your store all year long. I have heard that you will send your employees home when they hit there 8 hours rather then have them finish there job. Where are the stockers in the day when the shelves are empty? Your store manager is to worried about spending money to run this store properly.Having talked to many of my neighbors we are sick of empty shelves and everything else. Today I am going to give your store 1 more chance. I expect to see the same and if I do this will be my last time. I will drive the extra 40 miles to shop at Safeway in Fraser. Having said this I will also champion locals to boycott your store. meats, bakery, canned goods, frozen and cooler cases, when it comes to a variety of selections. I always get excellent help in all the other huge departments for anything I need. The employees are always cheerful and pleasant while at the checkout counters, working with fresh food, or stocking stuff in the aisles. This is why KROGER/FRED MEYERS keeps me as a regular customer. I would like to send Kroger a complement for Scully at the Kroger store where I shop. I've been a Kroger customer for years and purchase 90% of my groceries there. Scully has always been friendly, helpful and courteous. An asset to your organization and your customers. I would also like to compliment Kroger management for employing Lee, a handicapped gentleman at my store. It reflects a human side of Kroger management. Kroger/Dillons store East 21 St. North, Wichita, KS: Staff 99% helpful. Disappointed that US Post Office service is no longer available for mailing packages unless you have exact postage: Weight scale is no longer available. I received excellent service at checkout from Elijah Sandre, she was friendly and professional. Have been a Kroger customer since the 50s. Have been a Food4Less customer since 2000. Yesterday 7/28/16 was the day that I ended that relationship. This was due to the RUDE and disgusting replies from the store personnel in the Deli Department. This store is located in Gardena, Ca 90247 on Artesia Blvd. I live in Mount Gilead and we have a Kroger store here. At one time not too long ago, the Store Manager put out the fresh cut fruit that had a 2 day shelf life on it in a bin for the public for free. This was in my account as well as a few other people a good community service for the less fortunate. But now we have a new Manager and as of 6-13-2016 and they stopped this benefit to the community. He would rather see it in the dumpster out back then in the homes of someone in need it ,poor attitude if you ask me. I Thought Kroger was all about the community. Or maybe just not the one in Mount Gilead Ohio. Please Change this cause there is another Store that we can support in this town with our business it may not have the selection but it has what you need and it is cheaper. I would be a shammed if I was that Manager and a shamed that he represented my Company. Why Does Kroger sell Whole Bean Coffee And NO WAY To Grind it In The Store??! Please Bring Back "In Store" Coffee Mills! Spotlight Should Have One, My Local Kroger is in Oak Hill, WV! Once again you guys and gals in corporate who have too much time and too little to do have succeeded in making the Kroger experience more difficult for the customer. Leave the store alone ! You sit at a desk and hand down orders for which you have no accountability and who takes the flack? The poor checker who has no input in the decision making but has to be the only contact the customer has. Quit already. The store was fine. Hello you guys are stupid as hell to give up the Copps name in Wisconsin and replace it with the pns name. Maybe you shoud look at your studies again The Copps name was the only thing that kept cstomers comming to NEW stores. The pickinsave name brings no might to NE Wisconsin. Ethier renam Them all or that is a bad investment to get into Chicago. visited the Troy, Mo store recently and I am sad to see local needs in regard to package size, only large or extra large is available in many items , for example carrots. This list could include items in many departments. Common sizes called for in recipes, for example on whole cut -up fryer was not available. Again this issue is in many areas and departments. Please remember that your corporate office is not ordering to meet the needs of the community. Please do not make your customers shop in your competitors stores. I visited your store on St. Louis St. in Batesville Ar. today at approximately 5:00 P.M. to have a prescription refilled. As I approached the door I was approached by a young man who wanted me to sign a petition for the purpose of putting an alcohol proposal on the ballot in the coming election. I am opposed to this proposal and am offended by a family oriented store like Kroger allowing someone to stand by the door and approach customers coming into the store. I am also offended that Kroger has donated money to this movement. I have been a Kroger customer for many years, but if this continues I'm sure I can find another store to shop. I shop at Ralphs 2417 E Valley Pkwy in Escondido, Ca. I would like to complain about an employee named Maria (from her name tag) that works at your Smith's center at 8555 W Sahara in Las Vegas Nv. I had taken advanage of your bulk products about April 7th concerning corn and beans on sale for $6 a case. I purchase one case of each and later when I got home I noticed that I had been charged $12 for the beens. On April 15th I was in the store again and I took the receipt to the casheir Maria and said I needed a refund. She took about five minutes to check the receipt out and said I had a different case of beans than what was on sale. I said I picked the case up where all the bulk items were stored seprate from normal shelves and I didn't think I needed to check every Brand name. She informed me that I was responsible form checking and it was not the store's fault that I didn't check. she followed me down the alise loudly telling me how wrong I was and I told her to get lost and that I was going to talk to her supervisor. She refused to give the name. You should get your employees trained at Albertson's because they know how to treat customers. I love my Fry's Kroger store and everything about it...I especially love the fresh meats. The steaks, ground sirloin, bacon and fresh fish. I used to go to Costco...but now I buy everything from at Fry's. I am a senior citizen and from time to time will use the motorized cart to get around. thank you for taking care of your senior citizens when I shop. I have been doing the survey every 7 days for months. It's awesome. However,the survey I took March 10th for 50 points has not been posted, and today is the 16th. Do I need to do the survey for 3/10/16 again? Please advise. I shop at the Palos Verdes CAl store and all the help there is exceptional esp Angie and Rosalie. Both my husband and I are impressed with the quality of the staff. Makes food shopping so much more enjoyable. Employees are always helpful. There are usually enough cashiers that one does not wait in line and for a few items the self-checkout is great. I am learning to use the digital coupon system and it will be of great help to a person on a fixed income. The store is very clean and I especially like the fresh seafood department. All in all I am a Kroger fan! I forgot to mention the pharmacy - they are so knowledgeable and helpful and always greet me by name. Thank you. This is my first time at doing this so far-so good.